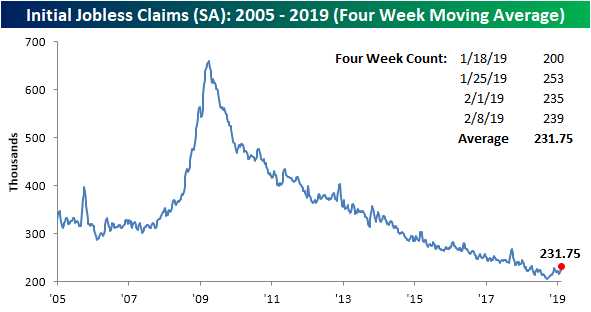 Initial Jobless Claims ticked up again this week after last week’s reading came down off of a recent high from the week prior. 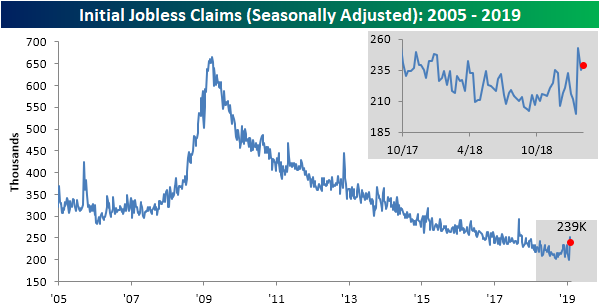 Since late last year, jobless claims have been fairly volatile with the seasonally adjusted number swinging from its lowest levels since the 60s all the way up to the aforementioned high which broke a historically long streak of strong readings. This week’s reading of 239K was a 4K increase from last week’s revised reading of 235K. While the reading is not a new high, it is at the upper end of the range that we have seen in the last year. Despite the uptick, this week’s data has maintained the streak of 206 weeks below 300K. While still healthy, several weeks of these spikes could be a sign of some cooling in what has been a historically hot labor market. The four-week moving average—a less volatile measure of this indicator—confirms this. Over the past few months, claims by this measure bottomed out and have been consistently working their way upwards. This week’s 231.75K was the highest since the middle of January of last year. Looking to next week, assuming the indicator does not once again fall to the bottom of the range it has been in, the low of 200K from mid-January will roll off of the average likely leading to a further increase. While the horrible Retail Sales report for December is getting most of the attention, the uptick in the four-week moving average is more of a concern. Unfortunately, the non-seasonally adjusted number does not provide much optimism either. 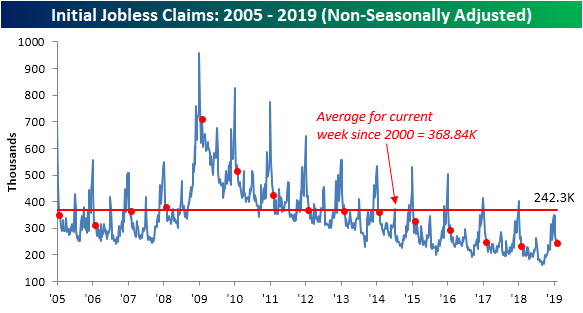 Claims by this measure came in at 242.3K which, for the current week of the year, which is the highest since 2017’s print. As claims often have, this week is still well below the average for the current week of the year since 2000. That average is 368.84K, placing this week’s data over 100K below the average.